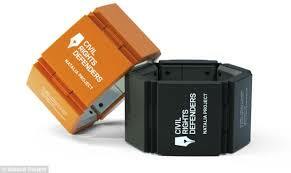 The Civil Rights Defenders group has produced smart bracelets to aid civil rights and aid workers at risk of being kidnapped or murdered. The bracelets use mobile phone technology to send out alarm signals and alert others to the fact that the wearer is in danger. They can be activated manually, or automatically if the bracelet is forcibly removed. They signal who’s in trouble and where they are, and alert nearby staff who might be able to help. They send out facebook and twitter messages, too. The first ones started being given out this week. I have often thought we should be using tracker devices on people at risk from kidnapping. The bracelets are bulky, and hostiles might rapidly develop tactics to reduce their effectiveness. They are a welcome addition to the safety of people at risk, however, and point the way to future developments. I have often thought we should develop internal trackers, ones that can be fitted in the body cavity or implanted under the skin. They would need to be largely non-metallic to evade detection, and should be capable of being switched on by a signal from afar, so they would not transmit signals until asked to do so. Kidnap victims fitted with these could then be traced in order that rescue attempts could be mounted.